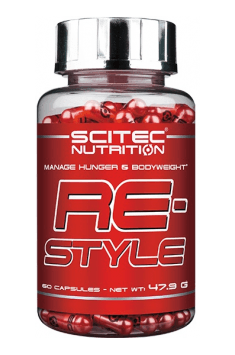 Scitec Re-Style is a multi-ingredient formula for fast and effective reduction of excess body fat. The formula combines a dozen bioactive substances which stimulate metabolism, speed up fat burning and improve the body’s physical and mental performance. The supplement is free of controversial chemical compounds that affect our health. It is recommended to individuals who want to lose excess weight in a lasting and safe way. It is perfect for physically active persons – it helps maintain adequate levels of energy, strength and motivation even when you reduce calorie intake drastically. L-Tyrosine is one of the indispensable amino acids which is a precursor to the class of neurotransmitters known as catecholamines (dopamine, epinephrine and norepinephrine). Increasing their levels stimulates the sympathetic nervous system and may thus activate thermogenesis and enhance lipolysis. What is more, higher dopamine levels contribute to increasing motivation and help control appetite. Tyrosine is used also for the production of thyroid hormones. Thyroid dysfunction and a deficiency of T3 and T4 are indicated as one of the main factors responsible for slowing down metabolism and gaining weight. Citrus Aurantium Fruit Extract is an excellent source of synephrine. The compound is an agonist of ß-adrenergic receptors which means that it may stimulate directly lipolysis and thermogenesis, i.e. processes with a major impact on the rate of body fat reduction. Furthermore, it curbs appetite and suppresses binge eating. Synephrine is also characterised by its stimulant effects. They are beneficial especially to athletes who do not want to slow down during their cutting phase and still perform hard training sessions. Garcinia Cambogia Extract is valued in supplements primarily due to the content of hydroxycitric acid (HCA). It is a bioactive compound with scientifically proven slimming properties. Its mechanism of action is to inhibit the activity of ATP-citrate lyase, an enzyme necessary for the synthesis of fatty acids from carbohydrates. Owing to that, it is possible to inhibit lipogenesis and hence the accumulation of body fat. HCA is also an appetite suppressant and thus make its much easier to follow a calorie-restricted diet. L-Carnitine Tartrate is a highly bioavailable and perfectly absorbed form of carnitine, i.e. a popular compound which speeds up weight loss. Carnitine is an extremely efficient transporter of fatty acids. It transfers them directly to the mitochondriaw where they can undergo ß-oxidation and be utilised for energy production. This enhances the effectiveness of metabolic processes in the body and helps lose excess body fat. Green Tea Extract (Camellia sinensis) is standardised to contain polyphenols and has primarily health-giving properties. It reduces excess free radicals, influences beneficially the lipid profile and reduces inflammation. Green tea is believed to have slimming effects due to catechines which belong to polyphenols, in particular epigallocatechin gallate (EGCG). It promotes fat oxidation and thermogenesis, thereby reducing body weight. CLA (conjugated linoleic acid) is one of the forms of linoleic acid which has been shown in scientific studies to be highly effective in reducing body weight, BMI and body fat percentage. Its basic mechanism of action is to inhibit the activity of enzymes promoting the accumulation of fats. What is more, CLA speeds up the breakdown of fat in adipose tissue. This compound may also improve mitochondrial function – it promotes energy production from glucose and fats. Higher efficiency of these processes enhances physical performance. Caffeine Anhydrous is sometimes called “pure caffeine”. It is formed in the process of extraction (most frequently from coffee beans) and dehydration. Because of that, it is highly concentrated and is more potent than the “ordinary” caffeine. This alkaloid is seen in the context of psychostimulant effects. It allows you to maintain high training intensity, despite a decrease in exercise performance due to calorie restriction. What is more, it speeds up resting metabolic rate and suppresses appetite in some individuals. Guarana (Paullinia cupana) Seed Extract has strong stimulant effects. Guarana seeds contain more caffeine than coffee beans. In addition, they are abundant in saponins and tannins which enhance stimulation. Importantly, caffeine from guarana is absorbed more slowly and that is why it provides stable energy and lasts longer than caffeine from other sources. It has slimming properties because it enhances the effectiveness of lipid metabolism and speeds up the overall metabolism. Some studies suggest that guarana may modulate the expression of genes responsible for fat production in the body. Alpha Lipoic Acid (ALA) is one of the saturated fatty acids, produced in small amounts in the human body. It supports body fat reduction primarily by boosting carbohydrate metabolism. It increases the sensitivity of cells to insulin, thereby helping stabilise blood sugar levels and preventing high serum glucose levels. Furthermore, ALA is a potent antioxidant. It is important because excessive physical activity combined with a lower calorie intake will stimulate the production of free radicals. Cayenne Pepper (Capsicum frutescens) is a potent plant thermogenic. Capsaicin found in cayenne pepper fruits promote the release of adrenaline and noradrenaline. It acts via the vanilloid receptor 1 (TRPV1). Consequently, it is possible to boost dietary induced thermogenesis and utilise fat stores for heat production. In addition, capsaicin inhibits the production of proinflammatory compounds in adipose tissue and influences beneficially the activity of adiponectin which affects most metabolic processes. Chromium Picolinate is a compound that combines the element chromium and picolinic acid. Such combination increases chromium bioavailability and absorption and thus maximises the effects of supplementation. The element has many vital functions in the body and is often used by individuals who want to improve body composition. It acts by maintaining glucose-insulin balance. It promotes strongly the secretion of insulin which is a potent anabolic hormone. Chromium is valued for its ability to curb the craving for carbohydrates. It will be appreciated especially by persons who cannot cope with their destructive addiction to sweets. To sum up, Scitec Re-Style is an effective fat burner which is free of excess stimulants and other controversial compounds which require a lot of experience from the user. It is perfect for individuals who start their joureny with supplements that promote body fat reduction. It should be appreciated that the supplement contains many compounds with a wide range of health benefits. Take 2 capsules a day, preferably on an empty stomach about 30 minutes before training. Take 2 capsules a day on an empty stomach. The supplement comprises many compounds with different mechanisms of action. Because of that, 2 capsules daily are enough to achieve the desired results. Do not exceed the dosage. The supplement should not be taken in the evening because it may cause sleeping problems. Anti-Caking Agents (Dipotassium Hydrogen Phosphate, Disodium Hydrogen Phosphate Dihydrate, Magnesium Stearate), Bovine Gelatin, Colors (Titanium Dioxide, Red Iron Oxide, Allura Red AC**). Conjugated linoleic acid CLA (cis-9, trans-11-octadecadienoic), - unsaturated fatty acid, an omega 6, which isomer of linoleic acid. The source of acquiring CLA is animal origin food (beef and high-fat milk products - including butter). Despite the incomplete research on its action in the human body, it is assumed that it has the antidiabetic, anticancer and anti-inflammatory effect. It speeds up the metabolic rate and reduces the activity of digestive enzymes and is used in weight loss diets that help shape the silhouette. Supplements containing CLA (or CLA mono-supplement) are recommended for people with different physical activity (from strength sports, to the low physical activity) for reduction of body fat and to improve body weight. Dosage: 3-6 grams per day in divided doses with meals.